Buy Vancouver steel firebasket: This steel firebasket can be used as both a fire pit and a simple barbecue. In the winter, sit back and enjoy the warmth of a real fire and in the warmer months it can be used as a simple barbecue for eating outdoors with friends and family.<br><br>Made from steel with a black high temperature paint finish, it is built to withstand intense heat. 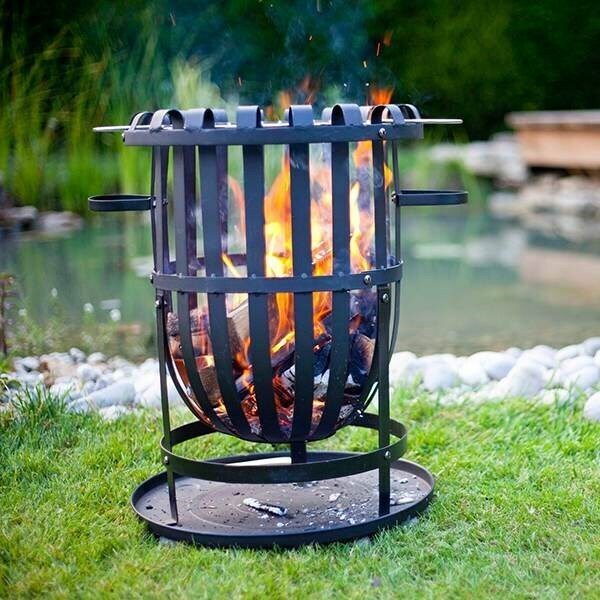 Due to its size it can also be used as an incinerator to burn garden rubbish or waste, complete with base plate to catch the falling embers.<br><br>Features:<ul><li> Dual use as both a firepit and simple barbecue </li><li> Capacity to burn well seasoned logs </li><li> Easy to empty and clean </li><li> Comes complete with removeable grill for controlled cooking </li><li> Can also be used as a garden incinerator complete with base plate </li></ul>Measurements:<br>Ø40cm x H56cm<br><br><b>Warning:</b><br>For outdoor use only. Keep children and pets away from the brazier when lit. Always position away from buildings on a safe non-flammable surface. If using on a paved patio, place on an additional protective paving stone made from solid natural stone or concrete at least 5cm thick. This will avoid possible discolouration and cracking of your patio, as some mock slabs made from resin or ceramic may be susceptible to heat damage. Only for use with logs or charcoal. This steel firebasket can be used as both a fire pit and a simple barbecue. In the winter, sit back and enjoy the warmth of a real fire and in the warmer months it can be used as a simple barbecue for eating outdoors with friends and family. Made from steel with a black high temperature paint finish, it is built to withstand intense heat. Due to its size it can also be used as an incinerator to burn garden rubbish or waste, complete with base plate to catch the falling embers. Think you only need one but would be for someone I love. This is such a beautiful object haven't had the heart to make use of it yet other than to have it in a prominent place on the upper patio and admire its lines. My daughter, who supplied the voucher, is also very enamoured of our choice. Not sure it could be used as a barbecue, though. Grill too far away from heat source.